Our Aussie Shampoo Miracle Shine special formula, with Australian Ginseng extract and Pearl Powder, helps to revitalize tired, dull hair leaving it sensationally vibrant and shiny. Now you can just wash & glow. Inspired by ancient Aussie beauty secrets, we used extracts of 'Australian Ginseng' and 'Pearl powder' in a secret shine formula. Pearls sparkle (duh! ), and Ginseng is known for boosting energy (and being generally fabulous). Follow with Miracle Shine Conditioner chaser. Our special formula, with crushed pearls, will leave tired hair positively gleaming. Shine formula that'll get hair shim shimmering everywhere it goes. With Australian Ginseng extract & Pearl powder. For dull, tired hair begging to shine.Move over dull, this hair's born to shine! 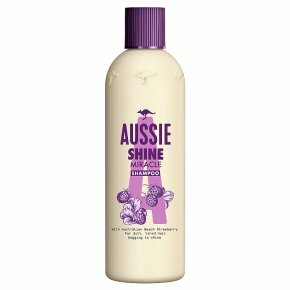 Inspired by ancient Aussie beauty secrets, we used extracts of Australian Ginseng and Pearl Powder to create this special shine shampoo that'll get hair shim shimmering everywhere it goes. Pearls sparkle (obvs) and Ginseng is known for its super revitalising properties.